ARE YOU READY TO LIVE A HEALTHY LIFESTYLE? Hair Mineral Analysis is screening test to measure the levels of up to 60 essential minerals and toxic metals. 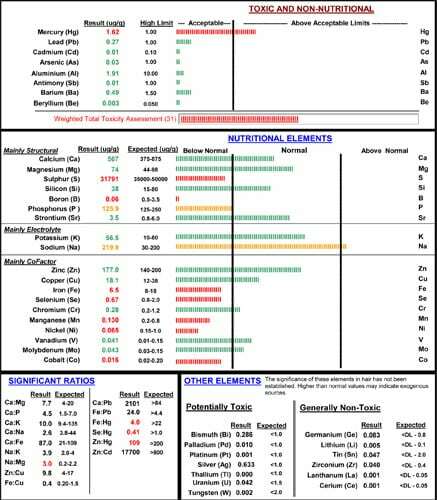 With correct testing and interpretation, one can construct a comprehensive metabolic profile of the human body. Hair is an excellent biopsy material. It is easy to sample, easily preserved and transported, represents a soft tissue of the body, and is a storage and eliminative tissue. As hair grows it forms a permanent record of the body’s nutritional deficiencies or excesses. This information, along with dietary and nutritional evaluations, will provide the basis for a nutritional balancing program to establish and maintain optimal levels of wellness. By correcting tissue mineral levels and ratios with proper diet, supplementary nutrients and lifestyle modifications, many physical and behavioral health conditions can be prevented or reversed. Minerals screened include electrolytes – calcium, magnesium, sodium, potassium and phosphorus and trace minerals – copper, manganese, chromium, selenium, iron, molybdenum, lithium, cobalt, and zinc. Toxic metal screening includes lead, mercury, cadmium, arsenic, nickel, and aluminum. A very high reading may represent a toxic amount of the mineral in the hair, and/or in the body tissues in general. In the case of a toxic metal, any deposition or accumulation in the hair indicates some degree of toxicity. High levels of toxic metals inhibit the body’s ability to process and assimilate specific nutritional elements that are essential to good health and have a proven link to many types of diseases. Research show that trace minerals and metals are accumulated at concentrations that are 10-50 % higher in hair. Blood and urine tests give an instantaneous reading that may be affected by many factors. Urine screening is a most effective tool in measuring the progress of detoxification/chelation treatments. Hair analysis gives a long term reading that is unaffected by recent meals, activities such as exercise, or emotional states. Toxic metals rarely remain in the blood or urine for long, but often deposit in the hair where they can be measured over a three-month period.